If CalPERS wouldn’t apologize for the propaganda it put out to get SB 400 passed in 1999, starting the retroactive pension spiking that is now destroying local governments, why would it apologize for shady behavior now? If CalPERS’ upper ranks for years engaged in gross corruption even as CalPERS offered itself up as a moral force for socially conscious investing, why would it notice the dissonance between the high opinion the agency has of itself and the way it looks to the rest of the world now? If CalPERS thought it was an appropriate use of public funds to build itself a 560,000-square-foot, $153 million tribute to its glory and importance, why would it be expected to behave prudently with taxpayer money now? If CalPERS reacted to a factual analysis questioning its investment history by having its high-paid lead flack engage in a juvenile tirade against the Bloomberg reporter who wrote the analysis, why would it be classy now? If CalPERS spent years denying the pension crisis was real, why would it show any common sense now? 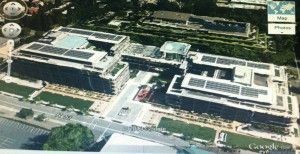 CalPERS’ massive headquarters is probably visible from outer space. But so is its bizarre combination of self-congratulation, incompetence and obliviousness. The California Public Employees’ Retirement System: Always assume the worst. Don’t let any “significant distraction” prevent you from understanding that it’s the CalPERS way. Here’s a little fun-filled fiction courtesy of CalPERS. After reading that BS I would like to blow up the calTURDS building is Sactown. This article hit on every cylinder. Thank you for keeping a close eye on CALPERS, which I’ve recently learned is as bloated and corrupt as any New Orleans politician.The machinations behind the scenes show that the unions control our state government. Lock stock and barrel. Think we just got some pension reform? Think again. All manipulated. Those with jobs in the private sector generate the revenue to support those that work in government and those that are dependent on government subsidies. California is 1 of 11 states where the collective government dependents “takers”, outnumber the private sector ”givers” to the economy. In California, there are 139 “takers” for every 100 private sector workers. Of those 11 states, 4 are major populated states such as California, New York, Illinois, and Ohio. The takers, outnumbering the givers, obviously control this uneven “retirement” playing field where the takers retire at an earlier age (50 to 55) than the givers (62+). The big hammer on the economy is the fact that California leads all states in total debt weighing in at $617 billion in unfunded liabilities. Other states are lining up to see where they rank for their unfunded liabilities. With the huge and growing budget deficits in California and other states, and nationally, the majority of the voting public is quickly shifting over to the takers. Our elected politicians need to keep spending to insure their reelections. The challenge to our elected officials will be how to reverse this “entitlement” momentum when reelection votes are controlled by the takers, as the minority private sector givers are shrinking and becoming less and less of a voice in our election process. The big hammer on the economy is the fact that California leads all states in total debt weighing in at $617 billion in unfunded liabilities. It is more than that, easily. Ronald Stein, do you have a reference for your claims? I’m interested in looking at the data. Some of what you claim is evident elsewhere. 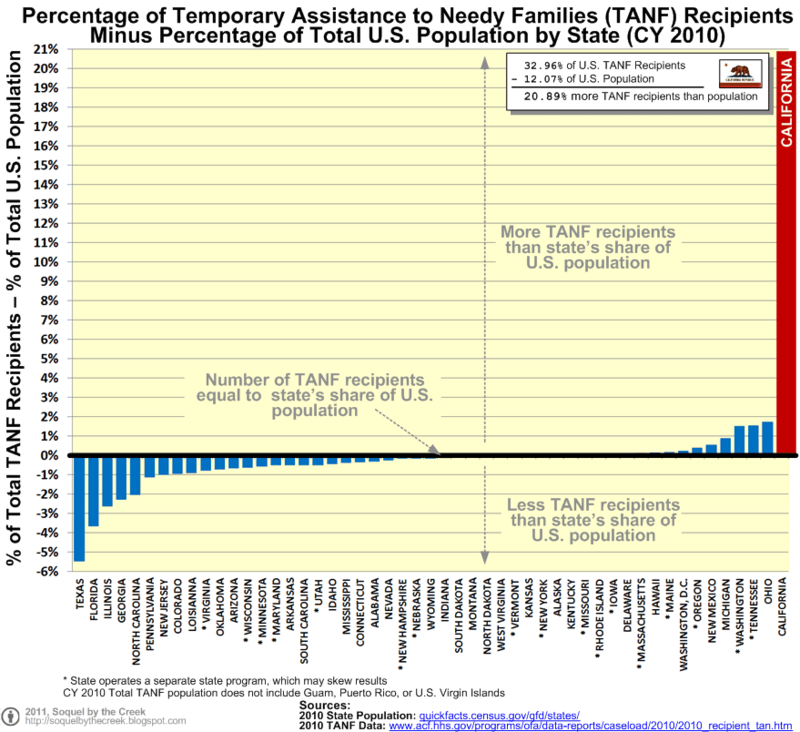 Which state has 12% of the nation’s population but had 33% of the nation’s recipients of Temporary Assistance to Needy Families (TANF) benefits? Here’s the data from the U.S. Department of Health and Human Services. In many ways, California’s Proposition 30 tax hikes are an extension of the “entitlement” philosophy. Big government is fine as long as somebody else is stuck with the bill. Ronald Stein stated it accurately, but it’s even worse. While the “givers” (productive Private sector workers) may out-number the Public Sector workers, they are not organized or focused and vote in relatively low percentages. On the contrary, due to the HUGE self-interest in the status quo of overcompensating Public Sector workers … primarily via their grossly excessive pensions, they (along with their entire families) vote in much higher percentages. I fear we’ve reached a tipping point where becoming “GREECE” may no longer be avoided. What a shame. The more intelligent of the Public Sector workers should understand they won’t get their promised pensions …. as it’s a mathematical impossibility.